Starting with this year, my role in summer reading is a specific one: I work at developing and implementing our measurement tools and strategies for capturing program outcomes and other evaluative data. To that end, the reading clubs committee's meeting that matters most to my work is the one where they confirm the program goals for the year. Not the theme, not the design of the program--the program goals. Once I've got a grasp of what the goals are, and why they've been chosen, I start thinking about how we can collect data to help us gauge our success. Goal 1: Increase the completion rate by 10%. This goal is a change in outputs--the proportion of registrants who went on to finish the program this summer as compared to the proportion from last summer. You need two data points to get your completion rate: the number of people who signed up for the program, and the number of people who completed the program. This is pretty standard data to collect for reading programs across the country. Goal 2: Increase engagement. This goal is both a behavior in itself, which is an output, and a change in behavior, or an outcome. In other words, the reading clubs committee was designing a program that would hopefully result in more people participating across the whole summer as well as engaging with both the program and the library at greater rates than they might have otherwise. Now, you may be thinking to yourself: but how do you measure engagement? That, my friends, is a really, really good question. And there's not necessarily a single best answer. You see, measuring engagement starts by first identifying what engagement means to you with regard to your specific program or service. So pretty much immediately after I got word that these were the goals selected by the reading clubs committee, I went to them with some questions. Specifically, what did they have in mind when they envisioned patron engagement? That's when I learned that they envisioned Camp Imagine participants sticking with the program throughout the summer; doing the program with some specific participatory behaviors; using the library in new ways; and interacting with one another and the community around books and reading. That may still seem somewhat amorphous and abstract, but this definition gave me plenty to work with--especially since the committee was designing the program so that participants could choose specific activities and challenges that tied into the engagement goal. 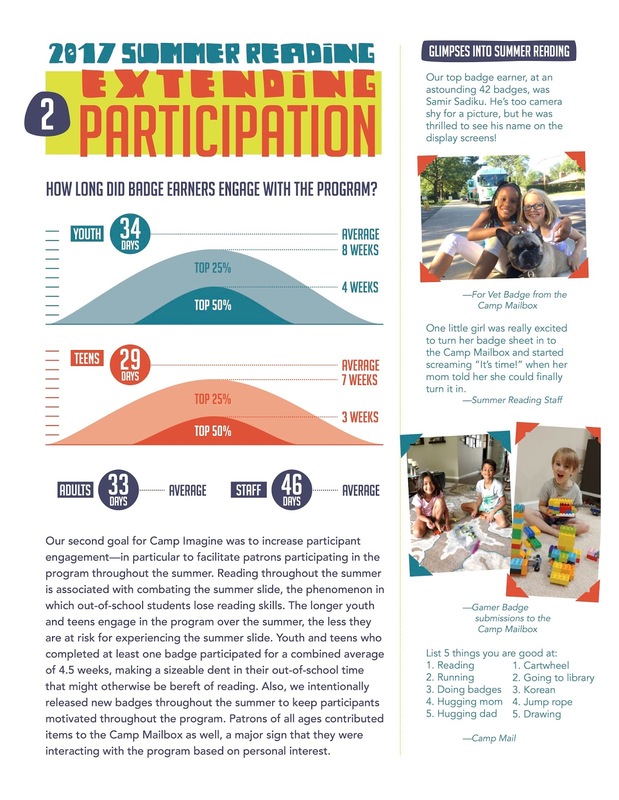 That length-of-participation type of engagement--sticking with the program throughout the summer--was measurable by seeing how many days, on average, Camp Imagine participants were active in the program. 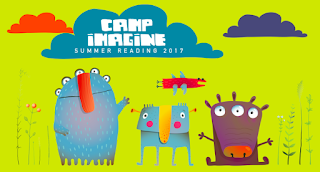 We tallied the number of days between registration and final visit to the Camp Imagine desk for 20% of our participants (a solid sample, considering we had over 3700 participants). This was a straight output numbers analysis. Because of the way we implement our summer reading program and the volume of participants involved, we knew we'd stick to a participant survey to capture most of the rest of the data to get at whether we were actually facilitating engagement. With the goals and definitions in mind, I got down to creating our survey questions to measure engagement. 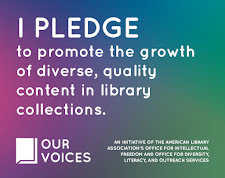 The survey was rounded out by questions from the PLA Project Outcomes summer reading surveys--we feel it's important that we contribute to the project, which provides its aggregate data for library advocacy across the country, whenever it fits into our own strategies and plans for capturing program outcomes. Our final survey was one half-sheet of paper, front and back, and we got a response rate that allowed us a pretty high degree of confidence in the data we collected. 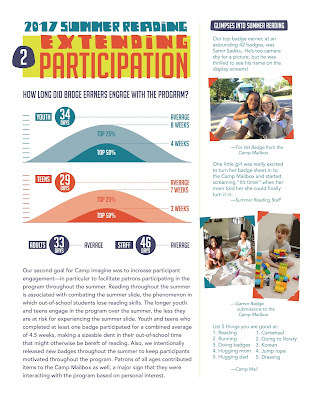 Our graphic designer Vanessa Rosenbaum created a gorgeous 4-page final report for Camp Imagine. Here's the page about engagement. I put together the data analysis and narrative, and the sidebar includes items from the Camp Mailbox and anecdotes. Youth who earned at least one badge (i.e., didn't just register and never return) participated on average 34 days, or about five weeks. Teens who earned at least one badge participated on average 29 days, or about four weeks. When we looked at the top 50th and 25th percentiles of youth and teen participants, these numbers were even higher. This type of sustained engagement has implications for combatting the summer slide. 84% of participants submitted something to the Camp Mailbox. 61% of participants viewed the Camp Mail. 65% of participants tried a library resource they'd never used before. 75% of participants recommended a book to a family member, friend, or other community member. 94% of participants feel Skokie is a community of readers. Now, considering participants had the option, at every single level of the program, to complete each level in the traditional summer reading way--by reading alone--we think these numbers are pretty remarkable. In every metric, over half of program participants opted to participate in our engagement activities alongside the traditional reading activities. And the fact the 94% of participants feel our community is one of readers? Well, that makes a librarian's heart happy. And these data all provide solid baselines for continuing to measure engagement over the course of subsequent reading clubs. So that's how we did it: that's how we measured engagement during Summer Reading 2017.